What’s Wrong: Many organizations try to drive behavior change by tying employees’ compensation to customer experience metrics. While some level of compensation tied to CX can be helpful, it is often overdone. When you overly compensate on a single metric, it can often lead to unintended and detrimental consequences. Symptoms of these counterproductive behaviors include pestering customers for scores; focusing on activities that may improve scores, but aren’t good for the business; and actively debating the accuracy of the metrics. Rather than engaging in these activities, we want employees focusing on ways to improve customer experience. If there is significant compensation tied to any metric (including customer feedback), then people will look for ways to manipulate the measurement. If people don’t understand a metric, then tying compensation to it will have little impact on their behavior and any downside in compensation may create negative behaviors. If people don’t understand how they personally can affect a metric, then tying compensation to it will have little impact on their behavior and any downside in compensation may create negative behaviors. Treat CX as a team sport. Your customers’ experience is almost never the result of a single person, even if that person is the only one interacting with the customer. So focus on team-level metrics and compensation that encourages key groups of employees to work together towards a shared objective. Use an organization-wide CX metric. Developing a core CX metric for the entire organization that is tied to some compensation (not too large), is a great way to show commitment to improving CX, and it will encourage a regular dialogue about your overall CX performance. Bias rewards towards the upside. Consider starting with a compensation plan that is biased towards upside. In other words, you may want to introduce the plan where there is little negative impact on compensation if the group doesn’t hit a goal, but there is positive impact of they exceed it. This can help eliminate some of the negative perceptions early in a program. Celebrate good CX behaviors. Compensation is not the only reward system in an organization. If you want employees to behave in a certain way, then provide them with positive role models. Find ways to highlight employees who are demonstrating the behaviors that you would like others to emulate. This can include monthly or quarterly awards, shout outs at company meetings, or highlights across your internal communications. Make it unacceptable to game the scores. When an employee asks a customer to “give me a 10 on a survey or I’ll get fired,” can you really count on the accuracy of that customer’s rating? This may be an extreme example of “gaming feedback,” but many versions of this behavior occur all the time. To keep gaming feedback in check, it’s important to be explicit with employees about what the company considers to be unacceptable behaviors. I’ve identified five rules that you should strictly enforce with employees, which includes not talking with customers about survey questions, scores, or consequences. The bottom line: Use compensation to reinforce, not force, good CX behaviors. We published a Temkin Group report, The State of CX Metrics, 2017. Temkin Group surveyed 169 companies to learn about how they use customer experience (CX) metrics and then compared their answers with similar studies we’ve conducted annually since 2011. We also had them complete our CX Metrics Program Assessment that evaluates the degree to which these efforts are Consistent, Impactful, Integrated, and Continuous. Only 11% of CX metrics programs received “strong” or “very strong” ratings, while 64% of companies received “weak” or “very weak” ratings. Only one out of five companies earned at least a moderate rating for being Integrated. Sixty-five percent of companies are good at collecting and calculating metrics, but less than 20% are good at using analytics to predict future changes in the CX metric. Satisfaction and likelihood to recommend remain the most popular CX metrics, with satisfaction at a transactional level delivering the most positive impact. Only 10% of companies always or almost always make explicit tradeoffs between CX metrics and financial results. Companies identified the lack of taking action based on CX metrics as a top obstacle to their programs. The identification of this as a top problem increased the most between 2016 (54%) and 2017 (62%). We asked companies about their effectiveness at measuring 19 different elements of customer experience. They are most effective at measuring customer service, phone interactions, and customers who are using their products and services. They are least effective at measuring the experiences of prospects, customers who have defected, and multi-channel interactions. When we compared companies with stronger CX metrics programs with those with weaker efforts, we found that the stronger firms have better overall CX results, more frequently use and get value from likelihood to recommend metrics, and report fewer obstacles. 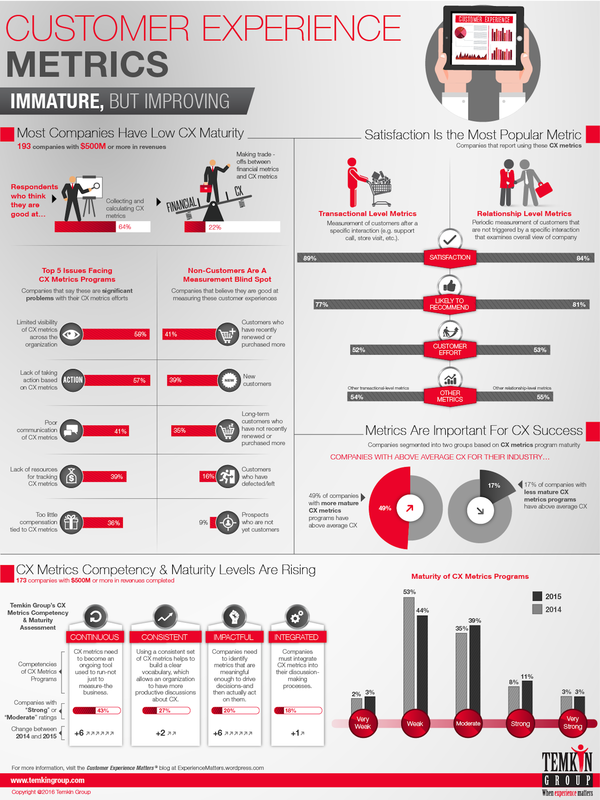 Here are some of insights from the report, State of CX Metrics, 2015. Employee engagement is a critical component of customer experience (CX). To determine how effectively human resource (HR) departments support these engagement efforts, we surveyed 300 HR professionals from large companies and compared the results to a similar study we conducted in 2012. Seventy-three percent of HR professionals believe that it’s very important for their organization to become more customer-centric, but only 31% believe that HR professionals are significantly helping these efforts. The good news? That’s more than twice the level of HR support we found in 2012. Compared with 2012, companies are both measuring and acting on employee feedback more frequently, and HR professionals have more bandwidth to work on employee engagement. When we compared the companies that deliver outstanding customer experience with the companies that don’t, we found that the CX leaders have better financial performance, enjoy higher levels of engaged employees, are more customer- and mission-centric, have HR groups that are more actively involved in CX and employee engagement activities, and more frequently measure employee feedback. To improve employee engagement, companies must master the Five I’s of Employee Engagement: Inform, Inspire, Instruct, Involve and Incent.